Cabinet Minister is the main in-charge of a ministry. A cabinet minister may also hold additional charges of other Ministries if no other cabinet ministers are appointed to take charge of that ministries. All Cabinet members are mandated by the constitution to be members of the Vidhan Sabha of Haryana. 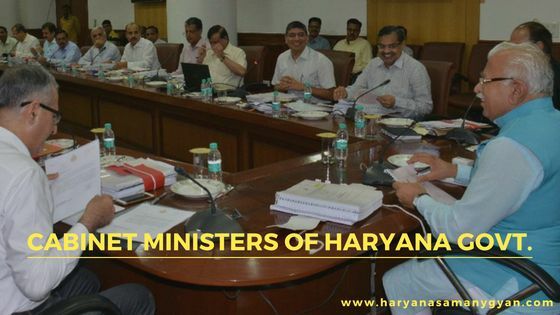 Cabinet ministers of Haryana and their Portfolios are listed below. Minister of State (Mos) handles or takes charge of specific responsibility in that ministry. For example, a minister of state in the Education Ministry may only handle Primary Education. There are two types of the state minister in Haryana government, Minister of state with independent charge and Minister of state. “Minister of state” of Haryana and their Portfolios are listed below.